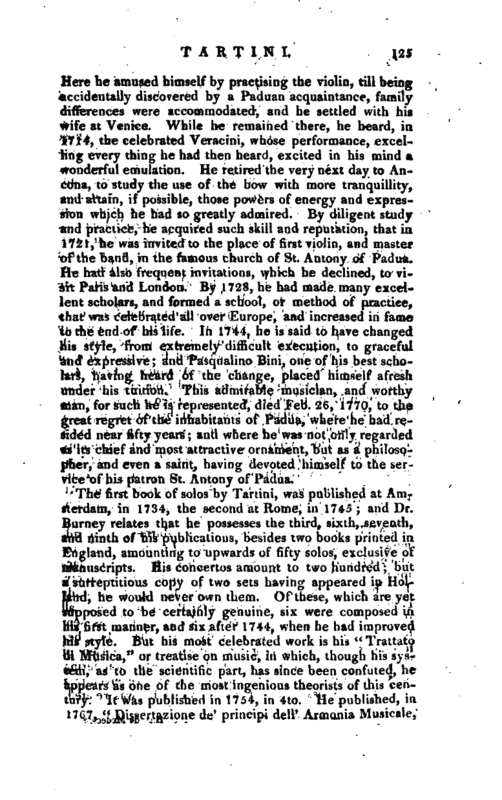 , styled by Dr. Burney, “the admirable,” was born in April 1692, at Pirano in the province of Istria. His father having been a great benefactor to the cathedral at Parenzo, was ennobled for his piety. Joseph was intended for the law, but taking up the study of music, among his other pursuits, it prevailed over all the rest in gaining his attachment. In 1710, he was sent to the university of Padua, to study as a civilian; but, before he was twenty, having married without the consent of his parents, they wholly abandoned him. After wandering for some time in search of an asylum, he was received in a convent at Assissi, by a monk to whom he was related. | Here he amused himself by practising the violin, till being accidentally discovered by a Paduan acquaintance, family differences were accommodated, and he settled with his wife at Venice. 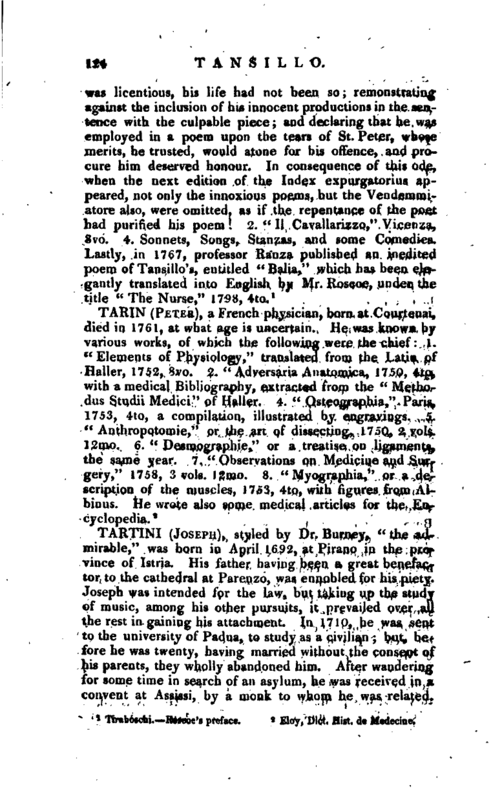 While he remained there, he heard, ia 1714, the celebrated Veracini, whose performance, excelling every thing he had then heard, excited in his mind a wonderful emulation. He retired the very next day to Ancona, to study the use of the bow with more tranquillity, and attain, if possible, those powers of energy and expression which he had so greatly admired. By diligent study and practice, he acquired such skill and reputation, that iti 1721, he was invited to the place of first violin, and master of the band, in the famous church of St. Antony of Padua. He had also frequent invitations, which he declined, to visit Paris and London By 17i38, he had made many excellent scholars, and formed a school, or method of practice, that was celebrated all over Europe, and increased in fame to the end of his life. In 1744, he is said to have changed his style, from extremely difficult execution, to graceful and expressive; and Pasqualino Bini, one of his besfc scholars, having heard of the change, placed himself afresh under his tuition. 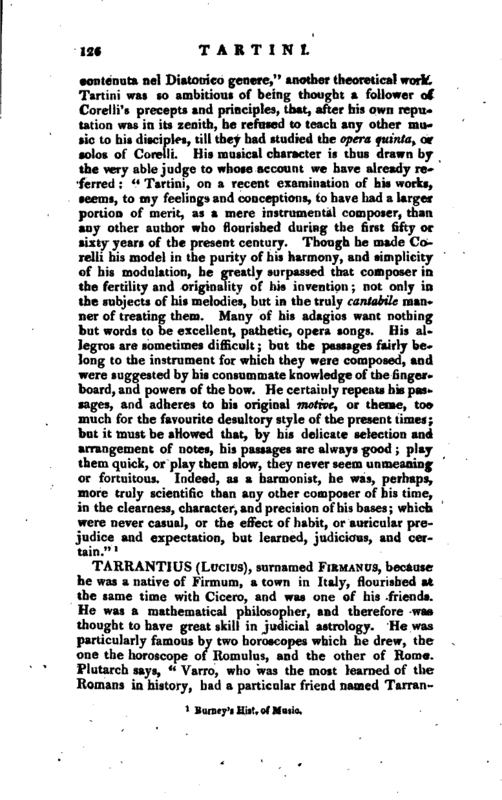 This admirable musician, and worthy mail, for such he is represented, died Feb. 26, 1770, to the great regret of the inhabitants of Padua, where he had resided near fifty years; and where he was not only regarded as its chief and most attractive ornament, but as a philosopher, and even a saint, having devoted himself to the service of his patron St Antony of Padua.